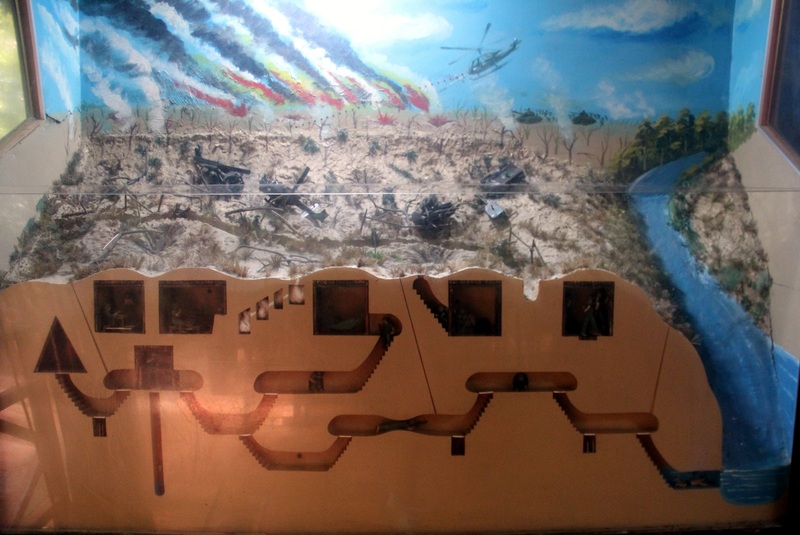 The Cu Chi tunnels are one of the best known “tourist attractions” in South Vietnam. And I put quotation marks because the tunnels are much more than a museum for the enjoyment of national and foreign visitors; they are raw history of Vietnam’s war times. 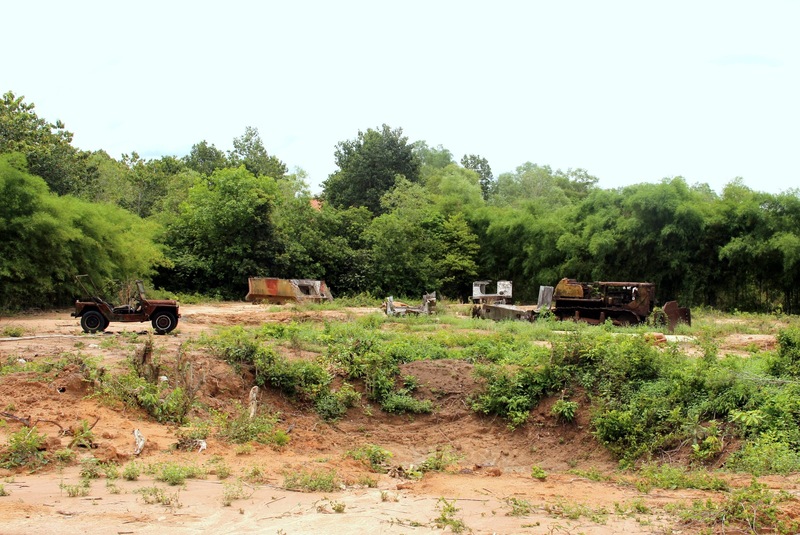 The local people of Cu Chi started digging this 250km network of connecting underground tunnels during the French occupation in the 40s and continued in the 60s, when they were used by the North Vietnamese to fight the American/South Vietnamese army. 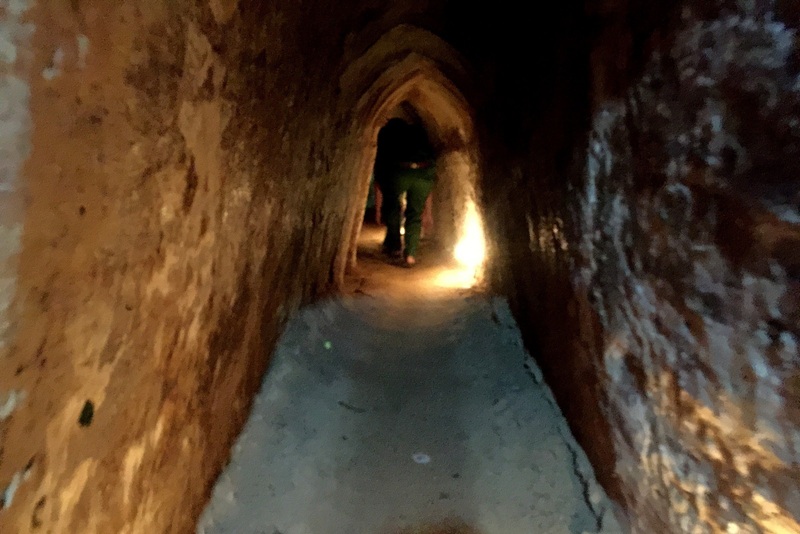 The tunnel system comprised not only corridors, but also all sorts of rooms (sleeping, dining, hospital, storage), booby traps, air filtration systems, etc., and was estimated to have hosted 16,000 people. The history of the tunnels is fascinating, a classic example of a guerilla resisting against a military superpower. The US launched massive bombing campaigns against the tunnels and sent several infantry divisions to try to find the entrances and force the Viet Cong out, but failed repeatedly. Being a history enthusiast, I definitely wanted to see this site during our trip to Vietnam, even more so after our day getting educated about the war in Saigon. The ticket to the tunnels was VND 70,000 (~$3), plus VND 20,000 (~$1) for the so-called recreation village, which at the time we didn’t understand but decided to buy anyway, and I’m glad we did. We walked a bit further to the actual tunnel and were asked to wait there. Once we had two more people, a guide dressed up in a funny uniform showed up and asked us to follow him into the jungle. It was lush and somewhat asphyxiating, and there were mosquitoes everywhere (bring repellant! )… It reminded me of so many Vietnam war movies. We sat down in a shack and watched an old video about the tunnels and their people, pure propaganda, but interesting nevertheless. Then our guide used a model to explain several features of the tunnels, like the river exits, or the conduits to evacuate smoke from cooking without giving away the hidden entrances. From there, we walked a bit further, and spotted the first tunnel entrances, disguised under mud and leaves, or under termite nests. It was time to get in and walk, or rather crawl, through a few meters of the tunnel. They say that these sections have been enlarged, but man, it felt narrow :S I’m rather small and agile, and I could barely move, so avoid bringing a big backpack (my mistake), and if you’re big, think about it twice. The tunnel was lightly lit and every once in a while, we could see or hear bats. We were in for literally 5 min, but I was happy to get out, and absolutely cannot imagine how people could live like this. Our guide then showed us some bunkers that were part of the network, a hospital and a cooking and dining area, and that are now open and easily accessible. They contain mannequins reproducing scenes from everyday life in the tunnels, and although it might sound lame, it’s kind of cool. We were offered some tea and tapioca at one of the improvised restaurants they’ve built inside the complex, and then headed out. By the exit, there were some remarkable booby traps, various designs used to protect the tunnels. There was an option to shoot some weapons, like AK-470s, which we had no interest in doing. The visit felt a bit short, so I was glad that we could still check out the memorial temple nearby, wander around the trails filled with displays of ordinance and surprisingly nice, and tour the recreation village. Here we got a good guide, who walked us around for about 30 min and told us lots of interesting stories. 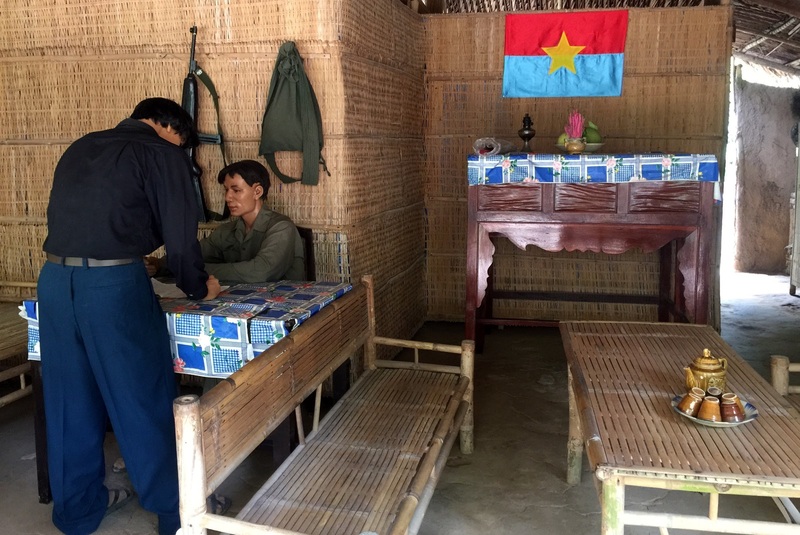 This site is as simple as it sounds: a reproduction with more mannequins of the life in a Cu Chi village during wartimes. There is a mix of everyday and war-related scenes, from people taking care of their orchards to excavating the tunnels to enlisting in the Viet Cong. Towards the exit, there are several damaged combat vehicles and bomb craters, to remind you that this place is no Disneyland. 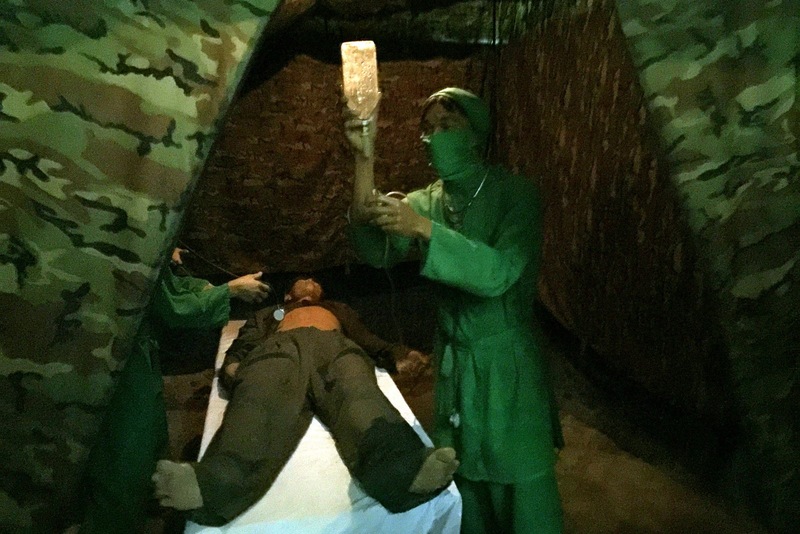 Overall, the visit to the Cu Chi tunnels of Ben Duoc was instructive and well worth the time. Hi can you help please? 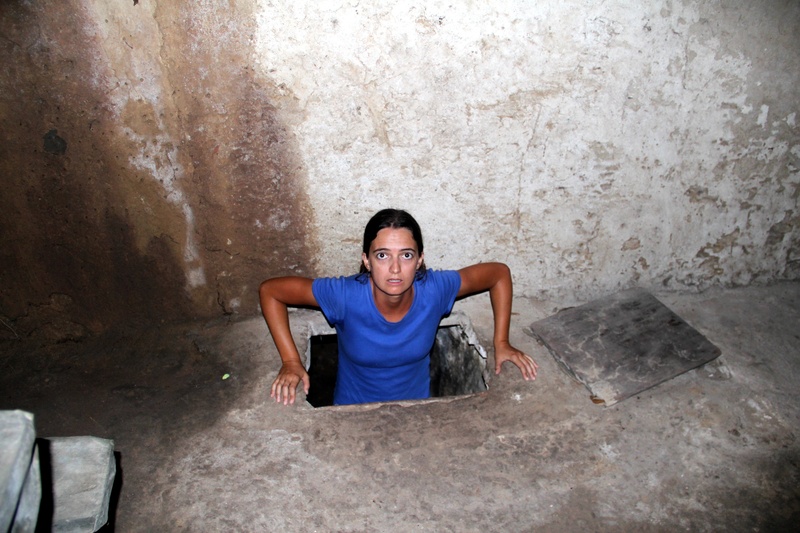 I am planing my trip to Saigon and the the Tunnels, but i know 100% i don’t want to go INTO the tunnels – i am claustrophobic. Just reading your account made me feel panicky haha! So my question is – is it still worth going out there then to see the recreation village? I hope ALL of the recreation village is above ground! Is it? Or it that also partly underground? So do they accept tickets just for the recreation village? How long do you reckon I’d need if i only wanted to see the recreation village and maybe shoot a gun (never have before!)? Maybe 10 minutes? or 20 minutes? yes, I think you should still go to Ben Duoc! You can buy the tickets separate for the prices I give above, but I would recommend to do both the recreation village (which is all above ground) and the tunnels. You don’t need to get inside to experience the visit, that part only lasts a couple of minutes anyway. You can go with the group for the video and the walk through the jungle and then meet them on the other side of the tunnel for the bunkers, and still get most of the experience. This would take about 30 min, including waiting times, and you need a similar time for the recreation village, plus I’d say 10 min for shooting, and another 10 min if you want to check out the pagoda. So I would plan for an hour and a half total, considering that there is some walking between places. Hi, do you need a guide to enter the Ben Duoc tunnels? 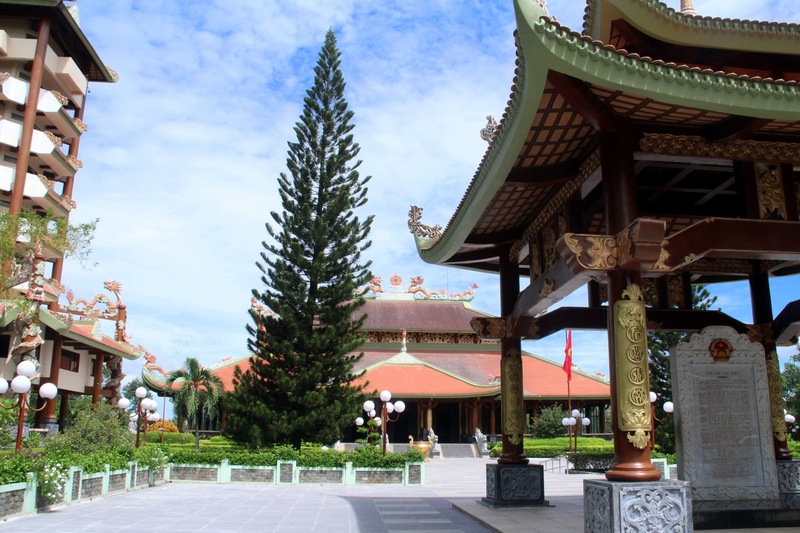 Yes, it is mandatory to use a guide in Ben Duoc (same in Ben Dinh), it’s part of your entrance ticket and gets organized on the spot. Hi Carmen, we are currently in Vietnam (Saigon). 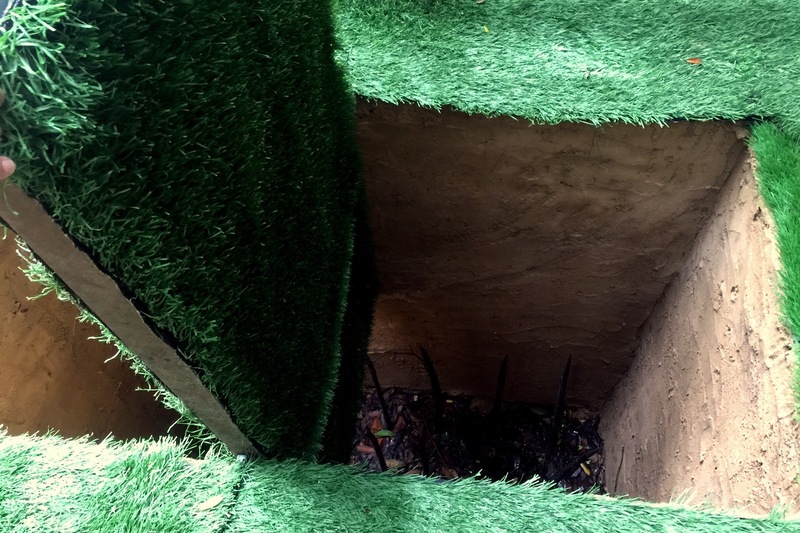 We’ve read your article about the Cu chi tunnels and just wanted to give you a thumbs up for this guide. We like the freedom of doing things ourselves. Looking forward to the tunnels and the village tomorrow! 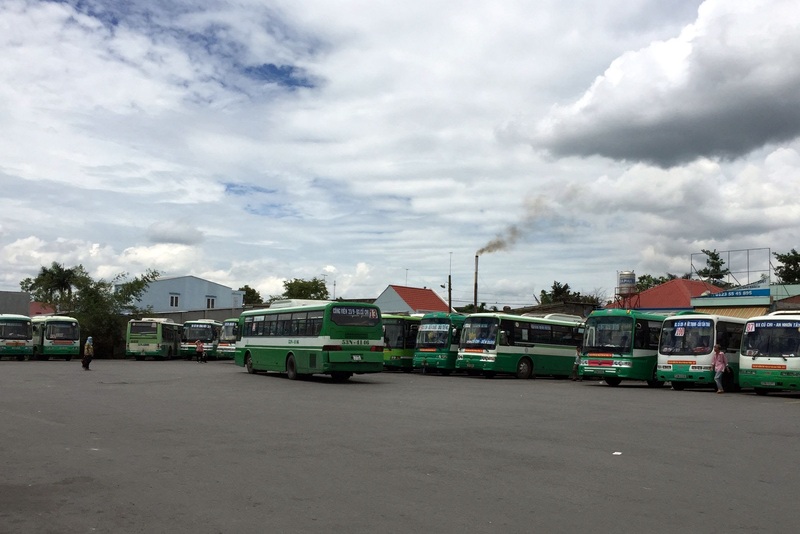 This is a nice read for visiting Cu Chi Tunnel, may I ask, when you returned to Saigon, are there buses dropping by outside Ben Duoc entrance to go back to Cu Chi Station? 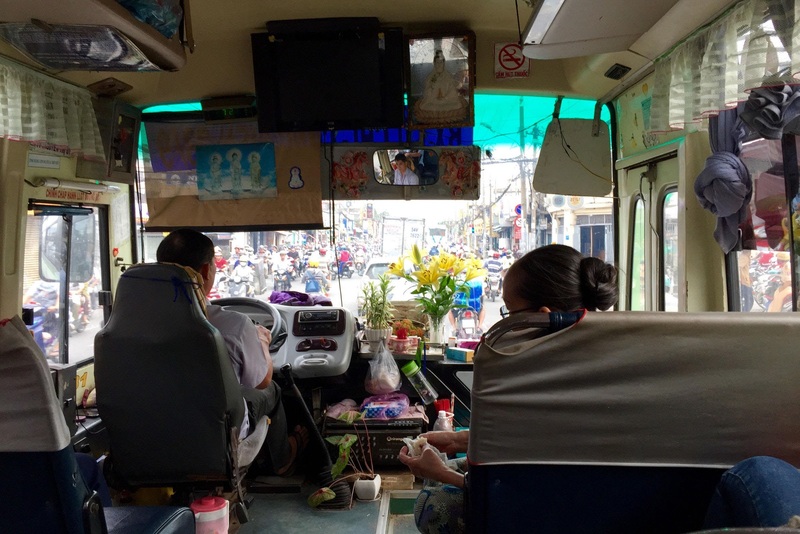 and is it the same Bus 13 that we need to ride to go back to Sai Gon? This is great. I’m so happy you put this easy to follow guide together. We’re in Ben Tre and hope NOT to go back to Saigon on our way to the tunnels. Hopefully I can navigate the local buses! hello. What is the earliest bus schedule for bus #13 & #79? we are planning to spent halfday in cu chi and half day city tour. is it possible? Thank for your article . I am sitting here reading your article about the tunnels of Ch Chui know that I could not stand to do a package tour of Vietnam . I what to know why the people of Vietnam struggle so hard . people. They do not deserve their struggle for independence turn into long quening mind numbing air condition bus tourist attraction.